Have you ever wondered how much of your body is water? The percentage of water varies according to your age and gender. The amount of water in the human body ranges from 50-75%. The average adult human body is 50-65% water, averaging around 57-60%. The percentage of water in infants is much higher, typically around 75-78% water, dropping to 65% by one year of age. Water is a basic right for all us living beings. We cannot live without it and it is the most important component of our diet. We may crave for fruit juices and aerated drinks, but nothing can quench thirst like plain old water. But most of the normal tap water or bottled water or Reverse Osmosis water and distilled water contains acidic pH that causes our body to become more acidic. This causes dehydration, making us weak and attacking the immune system of the body. Water needs to safe before drinking. The acidic water we consume has a positive ORP (Oxidation-Reduction Potential) which could lead to a number of health problems like acidity, fatigue, constipation, headaches, cancer, arthritis, immune dysfunction, hangovers and premature aging. Scary, isn't it? We all have water purifiers installed at our homes, but is that enough to guarantee safe drinking water? Purified water is an active absorbent and when it comes into contact with air, it absorbs carbon dioxide, making it acidic. Using purified water can be dangerous because of the rapid loss of electrolytes and trace minerals causing deficiencies, heartbeat irregularities and high blood pressure.The more purified water a person drinks, the more acidic the body becomes. And more acidic the body becomes, the more dehydrated the person feels. If this is not a cause of worry then what is? 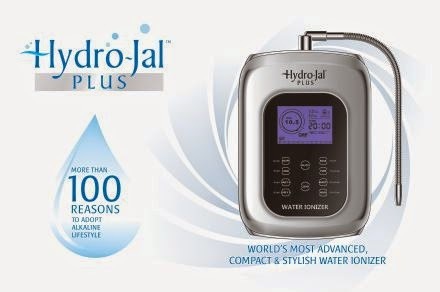 Now meet Hydro-Jal Plus, India's most compact, advanced, stylish and affordable water ionizer. So what does this do? I have already told about the harmful effects of acidic water. So what kind of water is good you must be thinking. The answer to that is alkaline water. This is the kind of water that is good for your body. Hyrdo-Jal Plus converts regular water into absolutely healthiest ionized alkaline water. It neutralizes excess acids in the body by providing it with alkaline pH rich water and keeping diseases away. 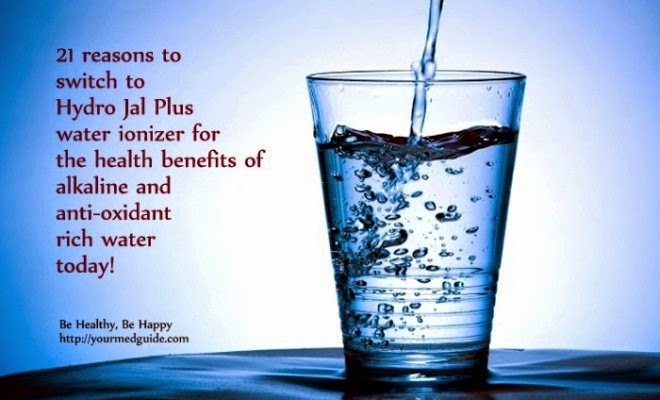 Hydro-Jal Plus ionized alkaline water brings you the wealth of health and holistic wellness. And these are not the only benefits of alkaline water. So why do you need to go for alkaline water? I shall give you a few reasons why. ~ An alkaline environment nurtures healthy blood cells and increases overall immunity. ~ Ionized alkaline water restores alkalinity and flushes out acidic toxins from the body. ~ It has high oxygen levels and delivers nutrients to your body cells more efficiently, keeping you more energized throughout the day. ~ It easily penetrates your body at a cellular level, thus hydrates the body better. ~ It prevents diseases such as Arthritis, Cancer, Hypertension, Diabetes, Digestive Problems, Weight Problems, Osteoporosis, Asthma, Allergies, Skin Disorders, and Acid reflux. ~ It slows down the ageing process. ~ It improves mental clarity and concentration. ~ It provides energy boost without extra calories. ~ It reduces chronic pain and fatigue providing you with better sleep and an energetic lifestyle. ~ It prevents your stomach from bloating after meals. ~ If you have had too much alcohol the night before, by drinking plenty of alkaline ionized water the next morning, your body can rehydrate more quickly and relieve hangover symptoms more easily. Diseases are expensive, health always costs less. Hydro-Jal Plus is completely economical and budget friendly. And most importantly it is very easy to use. With a height of just 13 inches and weight under 4 kg, this can easily be installed on your kitchen counter. It has a very high water flow output: Up to 3 liters a minute of electrolyzed water. It is self cleaning as it has automatic electrolysis tank cleaning after each use. This is a hassle free way to walk your way into good health. With pollution levels rising and the blistering heat, the need for safe drinking water is at the highest today. You do not have to go looking for it now. Safe drinking water will soon be available at home, in your kitchen. Request a demo for Hydro-Jal Plus now and see how you can make a difference to the lives of people around you.